The PR Lawyer: Keeping It S.I.P.S. If you answered by naming your company or your title or your general field, you just missed out on a golden business opportunity – to create interest in what you do and open the door for further interest. That was the main takeaway from a recent conference, LMA Metro Philadelphia’s Half-Day Educational Conference, presented by the HUB City View. 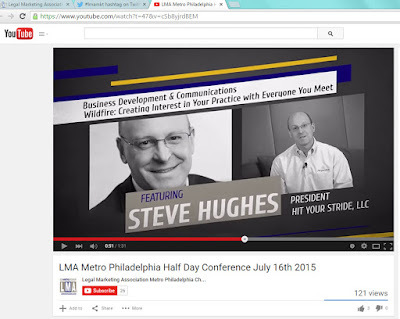 The July 16 conference was a wonderful opportunity to learn more about legal marketing from local and visiting marketing experts and it was interesting to switch over to the marketing side for a day and shift my mind out of the PR gear. The breakout session 2 program, “Wildfire: Creating Interest in Your Practice With Everyone You Meet,” really struck a chord with me. It was presented by Steve Hughes, president of Missouri-based company Hit Your Stride, LLC. The main theme was, how can we brainstorm new ways to market our profession or help our clients to do the same when networking? That’s all well and good, but there’s no hint of mystery to it. If we aren’t proactive about coming up with new ways to explain our jobs in a fun, interesting way, does that make us sound disinterested in what we do? The point is to make our explanations S.I.P.S. (short, intriguing, pithy and simple). If we can succeed in doing this, we can engage our audience in a way that presents opportunities for follow-up questions. Don’t give it all away at once; leave them guessing! How would you explain your profession to others?